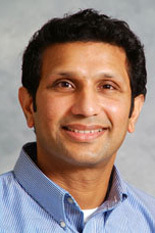 Iqbal Hamza, associate professor in the department of animal and avian sciences, won the Best Inventor Pitch at the 2010 Bioscience Research and Technology Review Day with a screening technique that allows doctors and veterinarians to screen hosts for multiple parasitic targets simultaneously. Hamza's technology was one of five innovations presented by faculty members and graduate students in an eight-minute pitch to a panel of early stage investors and venture experts at the Faculty Venture Fair, held at the University of Maryland. "This is the fourth year of the venture fair and we are excited to see how the faculty has bought into it," says Gayatri Varma, executive director of the university's Office of Technology Commercialization (OTC). "One of the challenges of the venture fair is that professors are forced to make presentations outside of their comfort zone. However, the quality of the presentations, especially this year, is an indication of the quality of research we have here at Maryland." The focus of Hamza's work is to discover innovative molecular approaches to target parasitic infections such as helminthiasis. In the past three decades, only four drugs have been developed to specifically treat this type of parasitic infection. All four have drawbacks. Hamza's novel approach is to target heme, a prosthetic group that consists of an iron atom contained in the center of a large ring and is an element of hemoglobin and other hemoproteins. All animals and plants make heme inside their cells to live, whereas most parasites hijack heme from their hosts to live. Targeting the parasites' heme transport pathway, Hamza believes, will be their Achilles heel. Hamza plans to first have medicines available for the veterinary market; these medicines would be designed to target worm infections in livestock and companion animals. The first pharmaceutical agent for human therapy will treat Leishmaniasis, a parasitic disease transported by sand flies. The first pesticide will treat nematode infection of corn, soybean, and potato crops. Hamza was the winner of OTC's 2004 Invention of the Year competition for his study of the worm C. elegans as a model for heme transport. "Being asked to present at the Venture Fair indicated that OTC approved of our technological and intellectual potential to find novel therapeutic approaches to treat parasitic diseases that afflict humans, livestock, and agriculture," says Hamza. "Winning it outright was a strong endorsement from the highly qualified judges that our technology will have long-lasting impact on global health and disease and that HemeCentric Inc. is on a great trajectory." Herman O. Sintim, assistant professor, department of chemistry and biochemistry, and William Bentley, professor and chair, Fischell Department of Bioengineering, who presented on techniques for developing new small molecules for the treatment of biofilm-related diseases and chronic wounds. The annual Bioscience Research and Technology Review Day Faculty Venture Fair is sponsored by the Maryland Technology Enterprise Institute (Mtech), OTC, and the College of Computer, Mathematical, and Natural Sciences. The pitch competition encourages scientists to consider the commercial potential of their work and challenges them to translate their ideas to a general, non-technical audience. Past winners have gone on to create successful start-up companies, including the 2008 winner, Matt Dowling, who started Remedium Technologies. The company, now in the Mtech VentureAccelerator Program, continues to develop innovative products to treat bleeding injuries. Lawrence Sita, winner of the 2007 venture fair, started Precision Polyolefins, a company that could revolutionize the plastics industry by introducing a clean alternative to existing methods of plastics production. "Sifting through over $500 million in annual research at the University of Maryland to find the gems that address real-world problems with great commercial potential is a daunting task," says Dean Chang, director of Mtech's venture programs. "These Faculty Venture Fairs tackle that challenge by bringing together innovative academic researchers, early stage investors, venture experts, and university entrepreneurship and commercialization organizations to highlight the best inventions on campus and help them find their way out of laboratories and eventually into the market." Judges for the event included: Martha Connolly of Maryland Industrial Partnerships (MIPS); Christine Copple of Starise Ventures; Michael Gutch of HIG Ventures; Linda Saffer of Maryland TEDCO, and Paul Silber of Blu Ventures.